U.S. Ambassador to the United Nations Nikki Haley had strong words for countries critical of America's decision to move the U.S. embassy to Jerusalem, vowing that she, President Trump and the U.S. will take Thursday's vote on the issue "personally." In a tweet, Haley warned that “the US will be taking names” of countries who vote in favor of a U.N. resolution criticizing the move. Drafted by Turkey and Yemen, the U.N. Security Council resolution also asks other countries not to establish diplomatic missions in Jerusalem. The resolution mirrors a similar one authored by Egypt, which the U.S. vetoed Monday. That resolution was supported by all 14 other members of the U.N. Security Council. US Ambassador to the UN Nikki Haley speaks during a UN Security Council meeting over the situation in the Middle East on Dec. 18, 2017, at UN Headquarters in New York. “At the UN we're always asked to do more & give more. So, when we make a decision, at the will of the American ppl, abt where to locate OUR embassy, we don't expect those we've helped to target us. On Thurs there'll be a vote criticizing our choice. The US will be taking names,” Haley wrote in the tweet. The tweet mirrored a letter sent by Haley to other U.N. member nations Tuesday and obtained by ABC News. "The President will be watching this vote carefully and has requested I report back on those countries who voted against us. We will take note of each and every vote on this issue," Haley wrote in the letter. In the letter, Haley also clarifies the U.S. is not asking other countries to move their embassies to Jerusalem, although she notes “we think it would be appropriate.” Instead, the letter requests support for the controversial decision to relocate the U.S. embassy. "The U.S. announcement is an acknowledgement [sic] that peace is best advanced, not set back, when all parties are honest with each other about the basic facts. 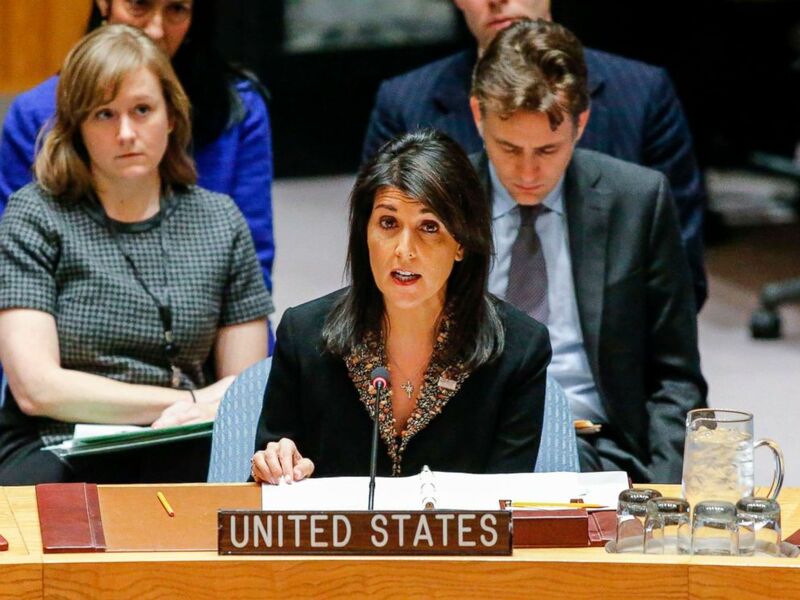 Jerusalem has been the capital of Israel since the country’s founding nearly seventy years ago," Haley wrote. "The President’s honest assessment of this reality does not foreclose any of the options considered by Israelis and Palestinians for decades." President Trump voiced his support for Haley’s message in a cabinet meeting this afternoon. U.S. 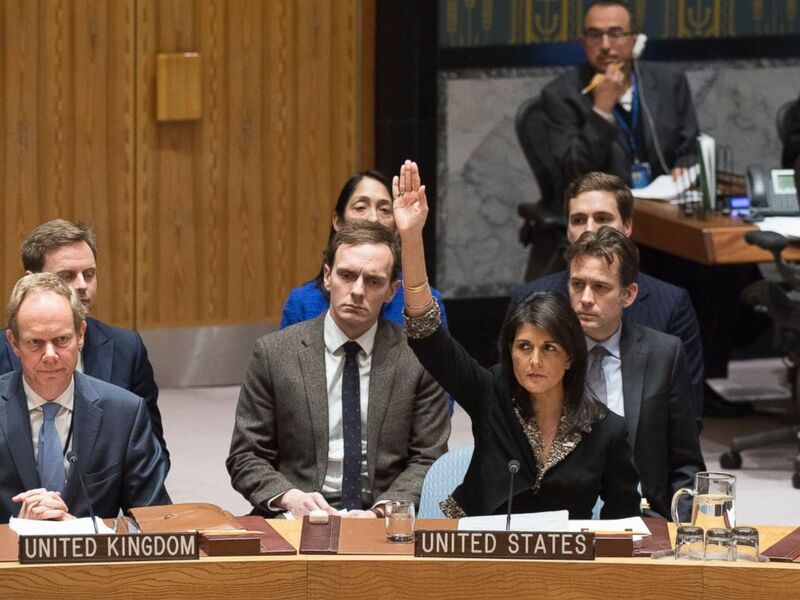 Ambassador to the United Nations Nikki Haley, right, votes against a resolution concerning Jerusalem's status at U.N. headquarters, Dec. 18, 2017. "I like the message that Nikki said yesterday at the United Nations, for all these nations that take our money and then vote against us at the Security Council or they vote against us potentially at the Assembly, they take hundreds of millions of dollars and even billions of dollars and then they vote against us -- well, we're watching those votes," Trump said. "Our great citizens that love this country, they're tired of this country being taken advantage of and we're not going to be taken advantage of any longer," Trump added.